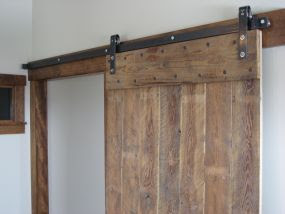 Since the theme of our home reno is "French Farmhouse," it wouldn't be complete without a few barn doors thrown in. And this week, we're making some real progress on getting our doors mounted on the tracks and made fully functional. I get really excited when I come home at lunchtime to see all of the progress. Here's a look at some of the doors that inspired us--as well as the doors we've hung this week so far. Yup, these look like barn doors. Love the X configuration. 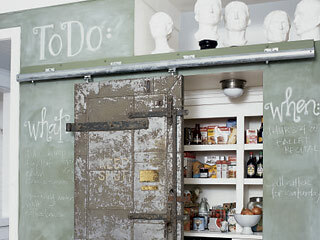 Look at this great old door, which encloses a storage pantry. And the chalkboard paint on a kitchen wall is pretty awesome, too. The kids would love that. 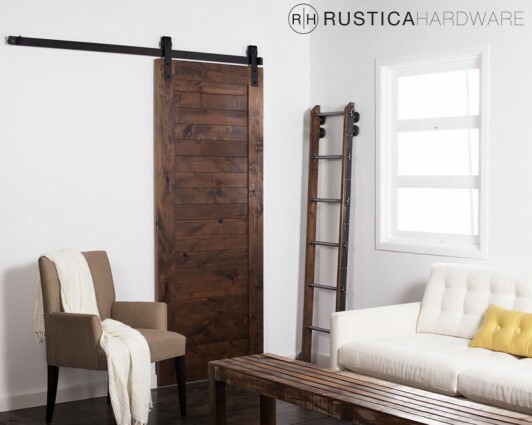 Clean, modern: Meet rustic wood. A close up of the actual hardware. This rolling hardware can get expensive, but we found a pretty cheap alternative online, from an agricultural supply store. Our hardware was nearly a third of the price of most. Another close up shot of the barn door mechanism. Looks easy to install, but it was a little bit tricky. In fact, notice how the hardware is installed just a few inches from the edge. We made the mistake of installing ours flush with the edge, which left a gap when the doors came together. Oops. They fixed that though. Here is our open floor plan great room and these doors, purchased from Pasadena Architectural Salvage a year ago, will open into our son's new bedroom. Door handles to come. A close up shot of these doors. I just love the distressed look of these doors. These are doors removed from a wardrobe. I loved the color of these, too. They were intended for a built-in closet, but they turned out to be too big for the space. But, they work here, don't you think? I'm getting a feel for the space now, but really do hope the cedar and additional 4x4 beams that we'll add to the ceiling will warm up this space and take off some of its cold industrial vibe. That's a lot of metal and stone right now. But I'm loving this wide open space with the loft peeking out up top. I feel a dance party coming on. 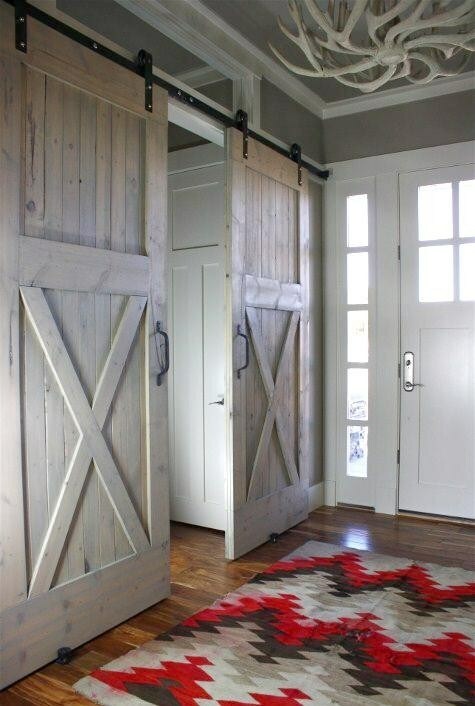 Imagine a wood loft ladder right between these doors. And a sparkly chandelier in that cut out space in the upper right. We made this cut-out to enhance the light in our dark hallway below. It's already working! Yeah. Here's my mad-scientist/contractor/baby-sitter/problem-solver extraordinaire husband. (Did I mention we had a baby just after our home renovation began? What were we thinking?!) He's 6'4", so you know these arched doors are pretty tall. They will also be mounted on barn door hardware, but they'll have to be custom-made. These are the nine foot oak doors that weigh about 200 pounds each. We purchased the set of two for $100 from a designer in Ojai, Calif., two years ago. I told her I'd send her pics of the doors when we finally got around to hanging them. Wonder if she'll remember us? This pic shows the inspiration for our oak doors above. 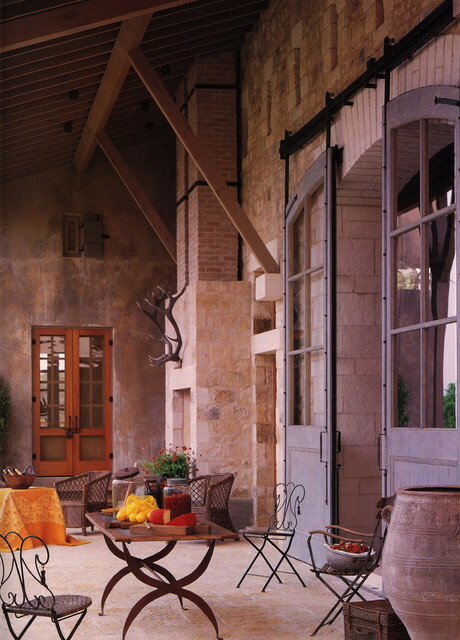 When I saw these arched doors hung as a barn door I knew I had to find a way to get this look. I think our oak doors come pretty close, although ours won't be blue--they will be white washed with the same Benjamin Moore White linen color we'll lightly rag on the cedar ceiling planks. Our crew stripped these doors. They were blue previously. I love the striations in the oak seen here. I thought the white washing was the way to go because it showcased the wood's interesting texture while tying into the light and neutral color palette of the rest of the great room. What do you think? Fingers crossed we made the right decision. I always feel I won't be totally sure until everything is complete. And then, my husband will want to kill me if I suggest some changes. Here's a shot of the dry wall going in. And a look at where the barn door track will go for those gargantuan arched doors. Since these doors are so heavy, they'll need to be mounted on plywood not directly onto the drywall. The brick arch will eventually be lime-washed to make the red tones a dustier, rosy hue. 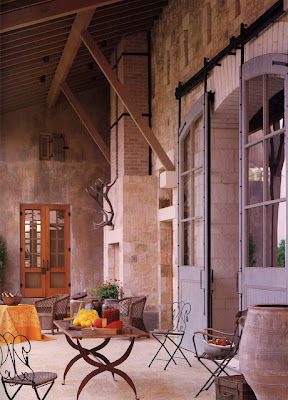 I have a blue chandelier waiting to go in just above a long farmhouse table in front of these doors. Can't wait to see that. I'm thinking the blue of the chandelier will pop against those white washed oak doors. We'll see. Stay tuned. I'll be sure to share pics of the final. Thanks for sharing this, Beth! I must say that barn doors can truly create a homey and rustic interior, be it French-themed or European country home-themed. And I think it also gives a statement to modern houses.